The LC 806 is especially suited for city centre street care. Its cleaning, washing and snow clearance capacities will make it essential all year round. Thanks to the performances of its hydraulic system, LC 806 gives faultless cleaning quality while respecting the environment. The best in cleaning and attractive in design, it enhances your citys image. 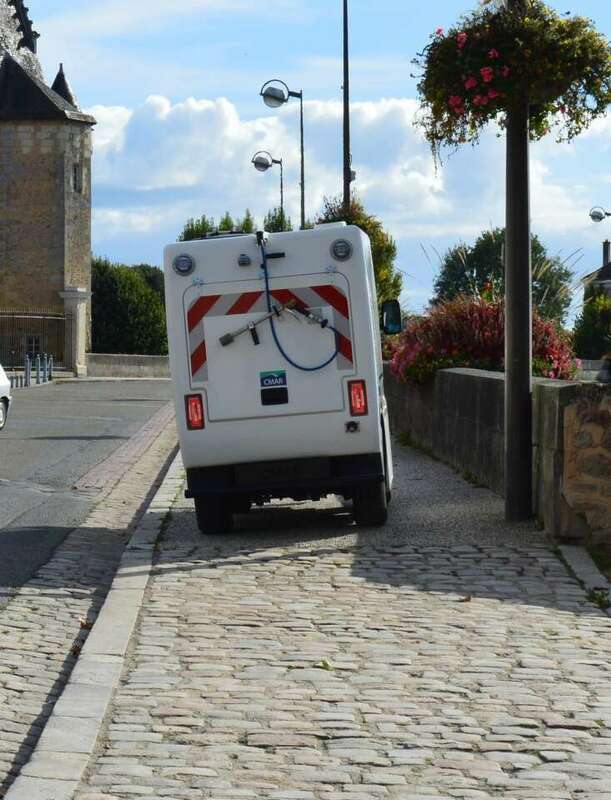 This compact hydrostatic drive LC 806 cold water pavement cleaner, with 4-wheel drive and 4 directional wheels is the most sold street cleaner in France. Its reinforced 2200 litres polyester tank gives it maximum working autonomy. Fitted with a telescopic cleaning bar from 1.20 m to 2.50 m and operating pressure of up to 80 bars, the CMAR pavement cleaner meets all the requirements for urban cleaning. Its 360° directional cleaning arm with built-in automatic winder allows it to pass under store awnings and through portals. The 2 fishtail type side sprays make it possible to clean under cars. With a flow pressure of 30 L / 200 bars, and an automatic 13 m hose winder, the HP unit option makes it possible to work with a lance, with the CC 600 cleaning dome or the CC 1200 cleaning bell. The vehicle has 4-wheel drive and differential and inter-bridge locking. Pitch and height adjustable steering column. Indicator lamps for: vehicle indicators, engine oil pressure, parking brake, brake fluid, headlights, cooling water level, tipper control, air filter and hydraulic oil. Switches/keys: headlights, gear change, 4-wheel drive, differential lock, ventilation, emergency lights, rotating light control, cigar lighter. Fuse box with a transparent cover on the dashboard. Combined switch on the steering column: intermittent windscreen wiper and washer system, horn, dipped headlights, full beam headlights, warning lights, turn-by-turn indicator with automatic recall, dial rev counter on the central column. The LC 806 cold water pavement cleaner is the normal evolution of the Euro 5 LC 860 cleaner that has been manufactured by CMAR for many years. Fitted with a Euro 6 direct injection 80 Kw engine, this cleaner meets all the latest environmental requirements. With its compact size and fitted with the latest technology, the LC 806 perfectly integrates your urban environment, to make it shine. Thanks to its 4x4 mode and its quick summer/winter equipment removal system, the CMAR LC806 cleaner can be converted to a tool carrier, with a salt spreader at the back and a snow clearance blade at the front. This makes the CMAR pavement cleaner a completely versatile tool.